For the last 3 months I have been unable to drive my Motability car. One Wednesday in March I began to have some very blurred vision in my left eye. Having had a corneal graft in that eye 20 years ago for Keratoconus I went straight back to my optician who told me to go to Moorfields Eye Hospital casualty immediately. That proved easier said than done, as I had to get my GP surgery to organise transport, because I could not see well enough to drive. The receptionist I first spoke to said she could not do this and it was only when I spoke to my excellent GP and the practice manager that everything got sorted out. The ambulance arrived quickly, and then I hit another snag, they couldn’t fit my wheelchair into the ambulance without folding it up. That meant taking out the batteries, which the paramedics were not supposed to do. Eventually they did agree and I was soon on my way across London, feeling very scared and anxious. On arrival at Moorfields I was seen very swiftly by the triage nurse, and soon after was taken through to see the doctor. After examining my eye thoroughly and taking a full history from me he said I would need to come back in two days time to see a Consultant. Eventually transport was sorted out to take me home and to come back again on the Friday. The kind nursing staff even found me a bed to lay down on whilst I was waiting. I eventually got home at 2am! I was tired, exhausted and in a lot of pain. Sitting in a wheelchair for over 6 hours doesn’t help with back and neck pain! Now I had lost my independence. I could not see well enough out of my right eye to drive. I was reliant on help from carers and friends. The only time I could leave my flat was for hospital visits. When I went back to Moorfields I saw a wonderful consultant, Mr Bruce Allan MD FRCS who explained that the corneal graft I had 20 years ago had partially rejected and my eye was leaking fluid. I was prescribed steroid eye drops and antibiotic eye drops to take and an appointment was made for the following week for me to return. I was to be transferred to another consultant Mr Romesh Angunawela BM, MD, FRCOphth, FRCSEd, who proved to be as superb as his colleague. He operates at a South London hospital where It would be possible for me to stay overnight. This was all arranged quickly and professionally, with the consultant himself phoning me to explain what would be happening. I was much reassured by that, even though I wasn’t looking forward to going into hospital. My operation was going to to be a complex one, but I had very good and thorough pre-op assessments by both the nurse on the ward and the Consultant Anaesthetist. My stay was rather mixed, I had excellent medical care and the surgery went well, but my nursing care left a great deal to be desired! A topic for a separate blog. Once home it was a case of regular eye drops and being patient. Not easy for me, who is always keen to be out going to a gallery or exhibition or off to visit friends. I also regularly see my cousin in North London to whom I’m very close. Despite being from different generations, we share many views and attitudes and have some surprisingly similar life experiences. She also now relies on me for emotional support and I love talking with her and helping to make her life better. From seeing her at least once and sometimes twice a week to only having phone contact has been hard for both of us. After 8 weeks of hospital visits I was beginning to struggle with not being able to do the things I take for granted. My iPad and iPhone have become even more important to me but what I missed most was the freedom of being able to drive. It was hard to find people who I could put on my car insurance. Motability has a rule that secondary drivers must live within 12 miles of me to be eligible. As most of my London friends don’t drive, this was a real problem, as anyone outside that limit could only drive for 30 days. I had one person who was willing to drive for me, but I would need to cover her travel expenses and pay for her time, I was happy to do this, but Social Services made it clear that they would not automatically increase my care hours to cover this. I was also warned that if I did ask for my hours to be re-assessed I was in danger of them being reduced not increased. With my current care hours being insufficient for my needs this was a risk I was unwilling to take. So I lost the services of that person as she could not afford to work for me for free. I really understood, she had financial commitments that meant she had to earn money, I just wished I could have had even temporary extra hours to employ her. Explaining this to my consultant one Friday afternoon he suggested that I be fitted with scleral contact lenses. These would help to promote healing in my eye, as this had been slower than expected, and give me enough vision to be able to drive. 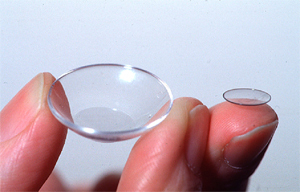 I’d never heard of these lenses, and once home, avidly searched the net for information. I saw one of the contact lenses fitters that same afternoon, and as they had difficulty getting the right lens to fit me, I was asked to come back the following Monday to been seen by Mr Ken Pullum BSc FCOptom DCLP, a highly experienced fitter specialising in scleral lenses. Ken could not have been kinder more patient or more helpful. After trying many different lenses he eventually found one that was a perfect fit and once he added the extra lens power, managed to give me excellent vision. Now it was a case of waiting for then to be made. Back again, the lenses was better, but my vision not as sharp as I needed it to be for distance, great for reading or computer though. So Ken came up with the idea of getting the spectacles department to make up a pair of glasses to wear on top of my lenses. I so hoped that would not take long. And indeed it didn’t, a hour later I had my glasses. With my son-in-law by my side (he had kindly got up before 6am and travelled across town to drive me to my appointment) I set off to drive to my cousin who was eagerly awaiting my visit. It was so good to drive again! Unlike many people, I quite enjoy driving through London, I’ve done so for years because of work, and am used to negotiating the busy traffic and sometimes crazy cyclists. My biggest fear is hitting one of them. I really think they should either have to pass a test, like the rest of us or be licensed. I don’t think London roads are designed to be able to sensibly separate cycles and other road users. My lenses are taking time to get used to and I can only wear them for a few hours before they get cloudy and need to be cleaned. Not uncommon from info on the net. I also discovered that I was allergic to one of the saline liquids needed to put in the lenses before insertion to keep the eye moist. It contained a preservative, and that meant I needed to use a another solution, but thankfully I had been given a different one, Quattro, which seems to work well. Yesterday it was great to be able to drive myself to get a much needed hair cut and some basic shopping, Not a big deal for most people, but it has meant the beginning of freedom again for me. I am profoundly grateful for the professional skills and expertise of Mr Bruce Allan and Mr Romesh Angunawela, also the knowledge and kindness of Mr Ken Pullum. You have all contributed to giving me my independence and my life back. All I need to do now is slowly increase my wearing time to get several consecutive hours wear from my lenses so I can get out and about for longer. I was recently referred back to Charing Cross Hospital to the Rheumatology department for a steroid injection in my left wrist, I’ve been there before and had excellent care from a lovely Consultant who has sadly left. I was seen by a Registrar who I’d not met before, and for some reason my full notes were not available. So, I gave him a potted medical history; severe spinal arthritis, scoliosis of the spine, displaced vertebrae in my neck, only 50% use of my left arm and 40% Lung function – not smoking related. I showed him a list of my medication, which includes morphine patches for pain relief. He then asked why I was using a wheelchair………………!! I got a sort of grunt in reply. Afterwards I felt really shocked. Was it too much to except that a senior Doctor would realise why I was using a wheelchair, without needing to ask? Or is the NHS not recruiting Doctors of a high enough caliber?